Cottage cheese/ Fresh Paneer- 250 gm. 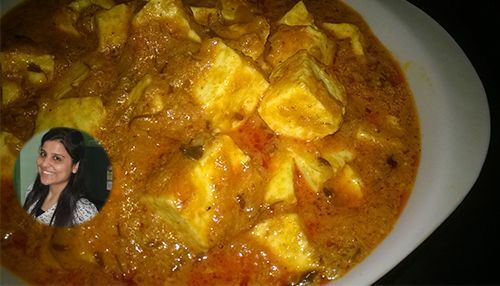 Grate cottage cheese/paneer in a bowl. Add grated cottage cheese/paneer and curd into a blender jar and blend it to a smooth paste. Make sure the paste is absolutely smooth and not grainy. Line a muslin cloth above a colander/bowl. Now transfer this cottage cheese/ paneer and curd paste to that muslin cloth. Bring the ends of muslin cloth together, tie a knot and hang it till all the liquid is drained completely. Now open the knot of muslin cloth and collect cream cheese in a bowl and refrigerate it overnight. Your homemade cream cheese is ready. When you want to use it bring it to room temperature and use for your cheese cakes and frosting. Take your cream cheese and condensed in a bowl and whip it using a blender. Break 10 oreo biscuits and fold in cream cheese mixture. Do not mix vigorously. Take 10 oreo biscuits in a polybag and crush using a rolling pin. 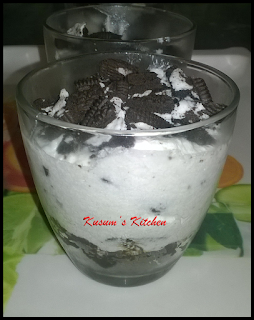 Add crushed oreo biscuits into glasses and make a thin layer. Now make another thick layer using cream cheese mixture over biscuit layer. (You can using piping bag to make cream cheese layer). Cover the top using some broken oreo biscuits. Refrigerate these glasses until chilled. Your mini oreo cream cheese cake is ready.